Colossians 3:3 (KJV); For ye are dead, and your life is hid with Christ in God. As a regenerated being in Christ, you are dead to the flesh and the world. Your real life is in Christ. This death is both by faith and consequently also by experience. But what really is this spiritual death? On one part, it is death to the riches of this world, the treasures of this life and the pleasures of the body. The other part of this death is when God kills your lust. For example, one might consider it a noble thing to desire the anointing, depth of revelation of God’s Word and a deeper manifestation of His presence. God wants you to have all these but He does not wish to give them to you because you lusted for them. This lust is when one desires and craves for spiritual things without divine purpose along with the desire. In its way, it points to the fact that a man is still alive in the flesh although he desires something spiritual. The danger of such a man is that when he receives these spiritual graces out of lust, he will use them for fleshly and carnal purposes because he is not truly dead in the flesh. Beloved saint, allow the Spirit and the Word of God to work in you until you are dead to the flesh and no lust for the spiritual things can be found in you. May you yield to these death experiences because it is in them that you truly live unto God. 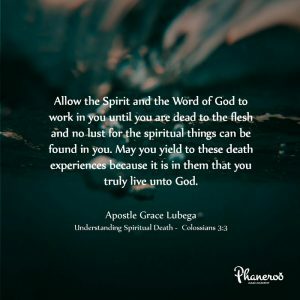 Allow the Spirit and the Word of God to work in you until you are dead to the flesh and no lust for the spiritual things can be found in you. May you yield to these death experiences because it is in them that you truly live unto God. PRAYER: My Lord, I thank You for this Word. What a blessed truth, that I can only die to the flesh so that I may live in You. I yield my spirit to You every day that I may decrease and You may increase. Consume me Lord until I am no more. In Jesus’ name. Amen.